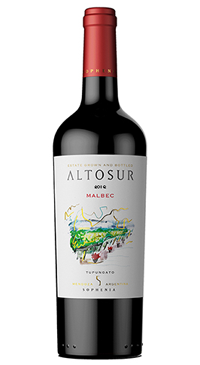 Altosur belongs to Finca Sophenia Winery, located at the slopes of The Andes mountains in Tupungato, Mendoza. At an elevation of 1200 meters, the climate is cool so the location benefits from abundant sunshine to fully ripen grapes. There is a sharp contrast between day and night temperatures that also plays a key factor in producing wines with ripe fruit development and vibrancy. Aromas of intense ripe fruit: cherries, blackberries, blueberries, and fresh plums, combined with spicy and floral hints. In the mouth the sweet and round tannins increase its fruit sensation and balance. Wine of good intensity, concentration, with a long finish.